Unloading a pallet of heavy boxes can be back-breaking work; all that bending and lifting causes wear and tear on the back, and no matter how much health and safety training you've had, there's always the chance that a slip in concentration could mean a serious and painful injury. 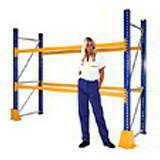 You can greatly reduce this risk with a manual high lift pallet truck, raising the pallet to a height where it can easily be loaded and unloaded without the constant bending causing many a bad back. 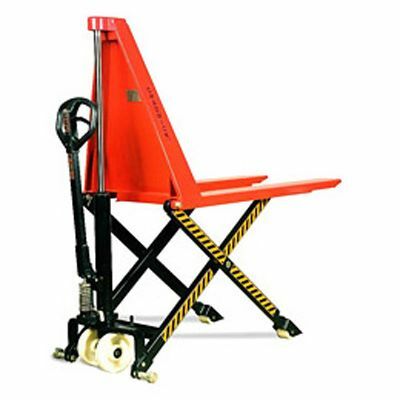 A maximum fork height of 800mm and able to take up to 1000kg, these high lift pallet trucks will protect your staff and reduce the days lost to such injuries. Added safety comes from the self-adjusting stabilisers, which automatically come into operation when the load goes over 400mm. 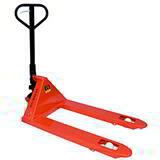 For loads under 250kg, a quicklift function raises the forks at twice the usual speed! 2 sizes of this incredibly useful pump truck are available, as is an even more labour-saving electric version! 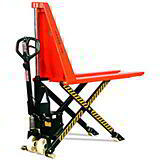 Two sizes of high lift pump truck to choose from!